Registering in SAM (www.sam.gov) for a CAGE (Commercial and Governmental Entity) code is mandatory if you wish to sell directly to the federal government. Registration is free on a government website and will take you about 30 minutes to complete. Your registration will contain all the information that the government needs to establish your basic qualifications and gives them the information that they need to pay you. Registration is a completely computerized system that is accomplished between various computer systems. Registration processing generally takes about 72 hours and will result in you being issued a CAGE code. The registration forms on SAM is extremely important and you need to fill it out completely. You can always go back and edit your record if you make a mistake or circumstances require changes. IMPORTANT: Check your CAGE code. Because the CAGE is so important, it is critical to check the status of your business in SAM by using the site to search for an existing registration. To do this go to www.sam.gov. Click on Search Records at the top of the page. On this screen, enter your DUNS number in the DUNS Search box and click the Search button. Go to www.sam.gov. Click on Search Records at the top of the page. On the resulting Search screen screen, enter your DUNS number in the DUNS Search box and click the Search button. If the resulting screen does not find a match, this means that you either do not have a CAGE or you have one and it is inactive. 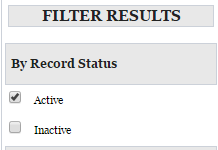 To check which of these is correct, check the Inactive box and click Apply Filters. If SAM now shows a record for your company, you will find that the record display show a Status of Inactive. If a record for you company appears, the Status will be shown in the upper right corner of the grey record box. The status should show as inactive. If no record is found, this means that a CAGE has never been issued for the DUNS number you entered. Depending upon the results of this status check for a CAGE code, one of these 3 status conditions will exist. Find the one that is appropriate for you and follow the instructions. You have a CAGE and its status is Active. You should open the record to make sure that all information is correct. To do this, you need to log into SAM with your Username and ID. Click here to access our CAGE EDIT instructions. You have a CAGE, but it is inactive. You need to open the CAGE record in SAM, review each section to confirm it is still correct and then SUBMIT. This will reactivate your CAGE code. Click here to access our CAGE REACTIVATION instructions.